When I first became vegetarian 4 years ago (my veg-anniversary is coming up on the 8th! ), I made it a point to be a great one and never feel deprived about anything. My first vegetarian cookbook had a hippie title like “Ecological Cooking” (I know!) and was purchased at a secondhand bookstore. One of my first forays in vegetarian cooking included an attempt to make longganisa (Filipino-style sausage) with lentils subbing in as the ground pork. Ha! Ha! Ha! Now present-me can chuckle at past-me’s cooking misadventures. That was 4 years ago. And now, fast-forwarding to present time: I am teaching a cooking class this Saturday on vegan sausage-making and yes, I’ve gotten quite good at it. But apart from trying to be a pretty good vegetarian, I love to inspire people to make more conscious choices about their health and particularly about the food they eat. Hence, the going-to-cooking-school stint and this quaint little vegan empire I’m running. 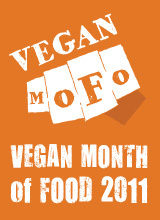 I want people to want to eat more vegetarian meals and I want them to love – nay, celebrate – it. Case in point: today I had the opportunity to cater for the belated birthday lunch of Amanda Griffin and let me tell you, nothing makes me feel all warm and fuzzy inside than to [a] grant a vegan birthday party request and [b] see the non-vegan guests enjoy the meal. Amanda interviewed me in March for her Glam-o-mamas blog and she’s been quite a fan of my private cooking classes. She shared my frustration about the inaccessibility of good vegan food locally and I helped by teaching her how to get the access in her own kitchen. She was in town this week and wanted to hold a completely vegan birthday lunch. How could I refuse? I love that she’s serious about whole-hogging the veg thing and I’m more than happy to help her on this journey. I’m also more than happy to help her trick her omnivore guests into actually enjoying a completely vegan meal 🙂 See, I really am not making up my claims that what I do is “omnivore-approved”! Rainbow salad with Caesar dressing and lemon-oregano vinaigrette. And some Twitter fun: Mission accomplished.